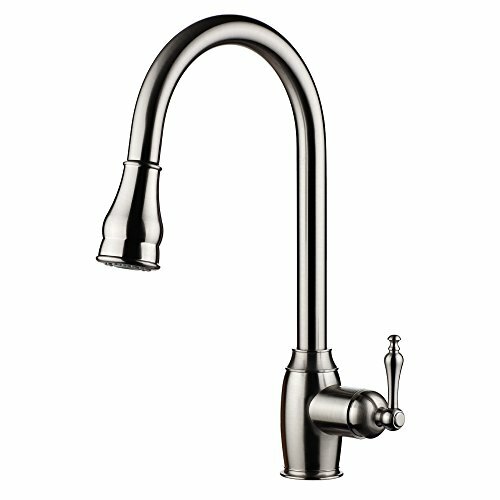 An innovative fit for a variety of kitchens and tasks, this kitchen faucet combines an elegant, universal design with exceptional ergonomics and functionality. The high-arch swing spout rotates 360 degrees, while the smoothly maneuvering sprayhead pulls down into the sink for up-close tasks, or out of the sink to fill pots. Sculpted buttons on the sprayhead ensure simple operation even with wet, soapy hands. The spray mode creates a wide, forceful blade of water for superior cleaning. The new docking system secures the pull-down sprayhead to the spout smoothly and quickly. These faucets come in three types of finishes, to blend seamlessly into classic or contemporary kitchen interiors. The attractive polished chrome or brushed nickel finishes are ultra-modern in style. For kitchen interiors with a classic look, the oil rubbed bronze faucets with curvy retro forms will create a luxurious, vintage look. The light, quiet nylon hose and ball joint make the pull-down sprayhead easier and more comfortable to use. The spray face features an easy-to-clean surface that withstands mineral buildup. Lead free copper construction - 100% harmless to health. Excellent finishes resist corrosion and tarnishing. Solid brass quick connector: G1/2 - No Screw Driver Needed. Accreditation by NSF recognizes pH7 as a manufacturer of high quality, food safe equipment for the kitchen. You can bring the great design and quality engineering to match with your lifestyle. High-arch goose neck spout and 361-degree spout rotation offer superior clearance for filling pots and cleaning. A high-tech docking system located within the spout, smoothly glides and securely locks the sprayhead into place. Simply release the sprayhead after use, it will accurately return home without manual alignment. The sprayhead features specially angled nozzles that form a wide, powerful blade of water to sweep your dishes and sink clean. Easily switch from stream to spray. If you have any questions about this product by HIPPO, contact us by completing and submitting the form below. If you are looking for a specif part number, please include it with your message.